Look! 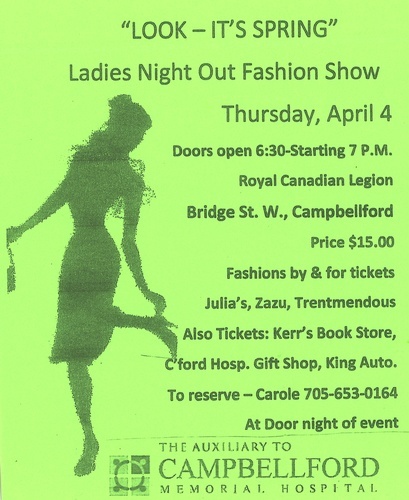 It's Spring Fashion Show featuring fashions from Julia's in Stirling, ZAZU in Campbellford and Trentmendous in Warkworth. Come and enjoy the fun. Put on by the Campbellford Memorial Hospital Auxiliary. Tickets are $15 each and are available from the Campbellford Hospital Gift Shop and at the door the night of the event.